EM-239 is designed for driving two actuators in parallel. The drive is done as synchronized according actuators pulse feedback signal. The synchronization is achieved by adjusting actuator speed during drive. If the adjustment can not compensate the unbalance between actuators, the motors will be stopped. This way the mechanical stress and breakage can be avoided. Additively the driver includes current limit and power stage temperature limit. Driver works with actuators that can offer pulse feedback signal. Pulses can be derived from Hall-sensors, reed or other kind of switches. 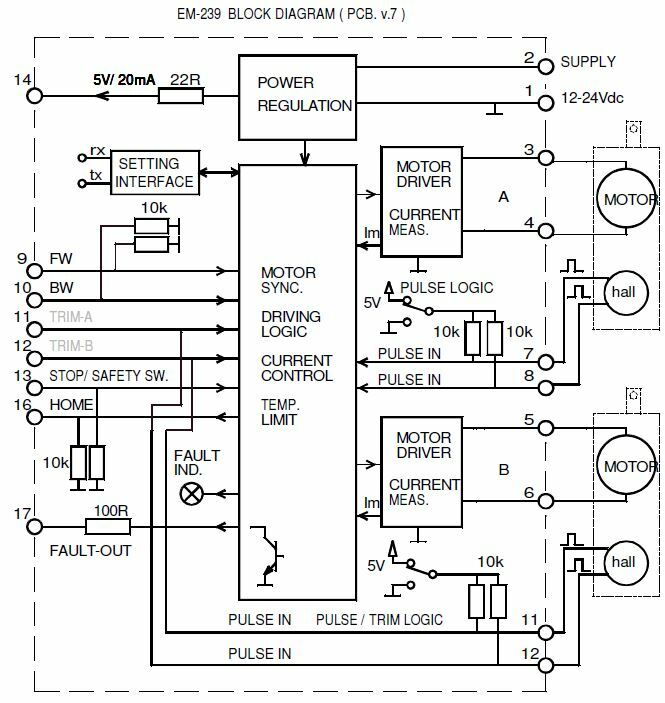 Driver can be set to read negative or positive pulses and also there can be selected two or one pulse line/motor mode. Driver power stage operates with PWM (pulse width modulation), that enables the high efficiency and low losses of power stage. with EM-268 and EmenTool App with smartphones for parameter setting. Pulse inputs pull- up/down 10kohm.